Spencer listened for Sir David to descend the spiral staircase. He could follow his progress by which tread was creaking. This was helpful information, in case Spencer was doing something that Sir David would not approve. Like looking at his Book of Words. David Wighton is the only magician to have been granted knighthood in the history of the British Empire, and he did not let one forget. He received this honor from the Queen for his service during the Boer War. He had developed Hypotyposis, and her military advisors were convinced it could be used to good advantage against the enemy. David Wighton was made a Colonel and put in charge of a brigade of magicians and sent to Swaziland. It had come to naught, but he did amuse the Queen with his wonders, and was awarded for that. Spencer had been in Sir David’s employ for three years. Working with the great man, he was the envy of every member of the BMAU. But, Spencer had become tired of cleaning capes and hats of guano, polishing canes and shuffling cards. He had learned the ins and outs of many illusions, but never the big ones. He longed to make a name for himself. In short, he was tired of being the assistant. One of the great man’s many achievements was his use of magic words. He did not rely on the likes of ‘Abracadabra’, ‘Presto’, ‘Hocus Pocus’, and certainly not ‘Bippity, Boppity, Boo’. Many thought he made them up, but not Spencer. One day in the library, while re-shelving Sir David’s books, he discovered an heretofore unseen button in the wainscoting. After a push and a click, a panel slid back, and there inside was a notebook and a fragile looking volume that appeared quite old. Spencer knew he had found the Holy Grail of Magic. With shaking hands he removed them and began to read. The notebook contained a history of the Boer War experiment to make the enemy vanish, and curiously the last entry was three weeks ago. Spencer knew the old man was crushed when he had not been asked to help during the ‘War to End All Wars’, and it appeared he was still working on a solution. Upon opening the old book, he felt he was descending through time as words leapt from the page and assaulted his mind. Some words he had heard Sir David use, so he knew he was on the right track. Many months passed, and the lad practiced his craft, often returning to the book for guidance. It was on this day, with the sun streaming into the library, causing dust motes to dance in the air, that Spencer returned to the book. The panel slid back, but the books were not inside. A sound behind froze Spencer. “Looking for something?”, Sir David intoned. “I didn’t hear you come down, Sir”, Spencer was flummoxed. Some weeks passed. Spencer had not been home and his mother was alarmed. His friends in the BMAU had not seen him, and that was not like Spencer. He loved a pint or two, and the chance to brag about Sir David’s latest success. In fact, he had been hinting at his own act soon to come. She suspected foul play. Sir David’s assistant answered the door, admitting the police. They were ushered to the conservatory, and stood humbly before the great one. The photo is of the famous British magician David Devant, performing his astonishing illusion, Hypotyposis… Spencer is on the far left, I think. There’s salsa music playing while I sit on the cobblestone steps watching people dance. If I stare straight ahead I can see over the red-tiled rooftops of Trinidad. I see the ocean, a great expanse of blue condensed into a thin line on the horizon. One of the dancers is a little girl, she’s wearing a bright pink shirt. She’s accompanied by her aunt or older sister. She looks to be about nine years old and already a great dancer. Her dark hair is pulled back into a neat bun and adorned with fake flowers. At the end of the song, they leave the dance floor. I see the cobblestone stairs beginning to fill with people. It’s fun to watch the band play because they all dance to the music with the rest of the dancers. The music they are playing is traditional that has been turned into rock. I convince my mom to dance with me, but neither of us can lead so we dance by ourselves, until a man in a red sweatshirt starts to dance with me. He’s a good dancer and conscious of the fact that I’m not the best. As we dance to the salsa, out of the corner of my eye I see someone join my mother. They are dancing faster than we are. When the song ends, I go back to my chair only to be asked again by a gentleman about 70 years old. We dance by the table my parents are sitting at. He also dances slowly, but as the song goes on we dance faster. When the song ends, he kisses me on the cheek and then we leave. And now we are in Santiago. Last night, with the help of a new local friend, we snuck Ula into a fabulous and seedy house of music, and danced! (the locals said I dance like a Puerto Rican – whatever that means!) Fantastic! Heading off on another memorable overnight bus to Trinidad tomorrow, and hopefully a little beach time. We really like Cuba in general; the people are very nice and helpful, the streets are incredibly clean even within all the colonial decay. And people are very surprised and pleased when we tell them where we are from! I am curious to know what ‘dancing like a Puerto Rican‘ means to a Cuban… it can’t be good. Anxiously awaiting Ula’s next post… and Krista’s… I’ll keep you posted. This is the first dispatch from our Foreign Corespondent, Ula Grace, as she explores Cuba with her parents. A world… seen through the eyes of an almost 13 year old student at Spring Street International School in Friday Harbor… that most will never visit. To see the start of this journey, click here… ULA GRACE… Foreign Corespondent … and stay tuned for her next post. I guess this is not really a story, per FF ‘guidelines’, but more an expression of a few recent random thoughts as I looked at Erin’s photo for inspiration and saw a river. It made me think of recently seeing the Sacramento river at its lowest ever, no rain to speak of since October there, and this is the rainy season. There is very little snow in the Sierra Nevadas and none at all from the passes of Southern Oregon to Redding. California is declaring a state of Extreme Drought, as we were in shirt sleeves when I was in San Francisco yesterday. And secession attempts are hot and heavy in the Jefferson Republic to create a 51st state. 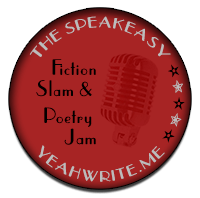 When I first started writing my blog on WordPress, I noticed a peculiar thing. As I typed my stories I would double space between sentences. When I previewed the story, I noticed a space had disappeared. Annoyed, I would go back into my edit mode and add the spaces back. After awhile, I would sometimes forget, and eventually gave up. I always wondered why this happened. Not enough to do a Google Search, but I wondered. Two weeks ago, I was listening to a show on NPR called ‘The Dinner Party Download’. I don’t usually listen to NPR on a Saturday afternoon, so the show was new to me. I wasn’t sure I liked it, but then I was driving so maybe not paying 100% attention. It seemed too busy, with a bunch of people trying to be cool, maybe that was the idea… dinner party… people conversing. They did have an interesting story about the 100 anniversary of the Mona Lisa being returned to France, after an absence due to a brazen theft by Italian Vincenzo Peruggia, which is a cool story in itself. But the gist to this story was an interview with some Italian bartender who had invented a cocktail for the occasion, called the Mona Lisa. Here’s the recipe if you want to try it. 1 part Alkermes, an Arabic-turned-Florentine liqueur from the de Medici era. As the show went on, they would sit around shooting the breeze between stories and I kind of half-listened, until I heard something about double spacing. I perked up, and one guy said that it depended how you learned to type. If you learned on a typewriter, you double spaced. If you learned on a computer, you single spaced. “If you double space on the internet (a funny way to put it I thought), it ate one of the spaces”, he said. So that’s what was happening! I was typing on the internet and my spaces were being gobbled up. I wondered if that was true. I learned to type on a typewriter in junior high school… I think eighth grade, maybe ninth or seventh. Hey, that was 55 years ago. I do remember a classroom with a hell of a lot of typewriters and kids clacking away. It was hard at first, but I got the hang of it and am a pretty good typist to this day. My granddaughter Isabel types a lot faster than I do. I’m sure she learned on a computer, I’ll have to ask her if she double spaces, maybe that’s why she’s faster if she’s just single spacing. A computer keyboard is easier on the fingers, I know that. My first typewriter looked just like the one in the picture above, the keys were hard to push, but I liked the feel. I remember when we got our first electric typewriter… that was something… and then we got one of those ball ones later on, that was fun to watch. I don’t remember the last time I used a typewriter. I’ll probably always double space, but I don’t think I’ll go back and add spaces on my blog now… I wouldn’t want to mess with the internet. I wonder how many of my writer friends double space. I wonder if any of my writer friends use a typewriter. 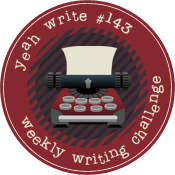 Here is a link if you want to read some of my writer friend’s stories… yeah write weekly writing challenge See if there’s any double spacing. Here’s the link to The Mona Lisa Returns to Italy story on at the Dinner Party Download, in case you are interested. To start off the 2014… my first blog post on WordPress… and an entry in a new writing group for me…’ yeah write’!